Line up a tee shot down a lakeside fairway, shop your way through the nation’s largest home furnishings store, enjoy an afternoon sipping craft beer, or hike scenic nature trails. 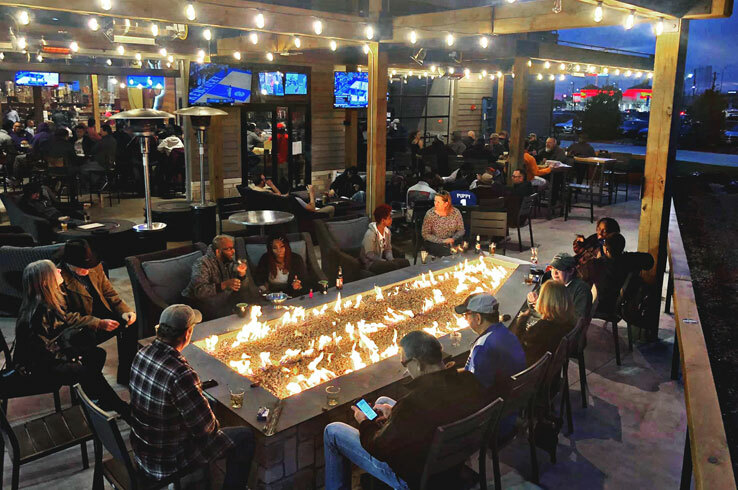 Settled on the eastern shores of Lewisville Lake only 30 miles north of downtown Dallas, The Colony is an all-in-one getaway where it’s just as easy to indulge in some retail therapy as it is to escape to the great outdoors. Read on to see some of the many amazing things you can do here and plan your visit today. A refreshing lake breeze, warm sunshine, and a plate full of something tasty. 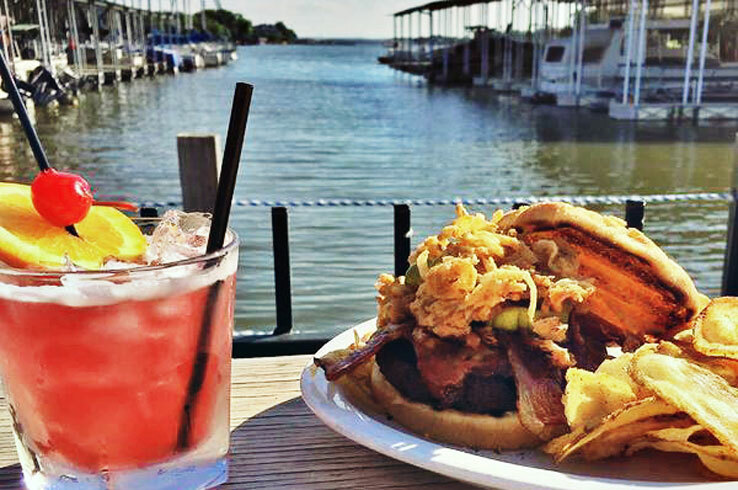 All these things are on the menu at Rockin’ S Bar and Grill, a rock and roll-themed restaurant serving up elevated pub classics at a pier on Lewisville Lake. Grab a seat on their floating deck and truly dine on the water with one of the best views in town. Try their pork shank pig wings, green chili burger, or fried gator basket as you sip on an ice-cold beer. As the sun sets over the water, take in the stunning views from the patio of Angelina’s Mexican Restaurant. This local staple offers up a festive atmosphere and genuine Tex-Mex fare made for a delicious night out. Explore these menus and more here. North Texas is a hotspot for live music, and The Colony is no exception. On any given night, touring bands and local talents light up the stages at one-of-a-kind venues across town. Top bands from across the country headline at Lava Cantina, The Colony’s largest music destination. The venue doubles as a restaurant that serves coastal Mexican fare with a Creole twist, including crawfish and gator dip and enchiladas made with French crepes. There’s even more music to be heard at Hard Eight BBQ, which showcases regional bands alongside its Texas-style smoked brisket, pork ribs, and other ‘cued meats straight from the pit. Another incredible music venue will be opening their doors, just in time for summer. Truck Yard is an outdoor venue with 15,000 square feet of heavily shaded, pet-friendly lawn. Named for its rotating food truck fare and known for its multiple bars, this venue is a true adult playground. 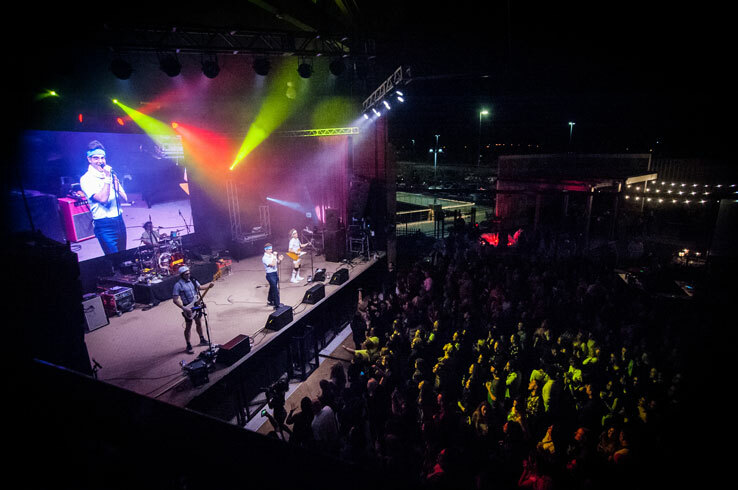 Be sure to grab a local brew or signature cocktail as you listen to regional artists strut their stuff on the rustic stage. No matter which spot you check out, you’ll get a true taste of the music that makes this part of Texas tap its toes. When it comes to dining, shopping, and having a great time, Grandscape doesn’t mess around. Spanning more than 400 acres, this all-in-one destination has more than three million square feet of shopping, dining, and entertainment. Catch a show at Lava Cantina or Rock & Brews and find your way through Nebraska Furniture Mart’s sprawling selection of home décor and electronics. Step inside the walk-in humidor and choose from cigars from around the world at Cigars International. The nation’s top cigar retailer showcases luxurious indoor and outdoor lounges, full-service bar, and a state-of-the-art ventilation system. Satisfy your taste buds at one of Grandscape’s many restaurants. Whether you’re in the mood for fast-casual eateries like Bread Zeppelin or upscale dining at renowned restaurants such as Akira Back (opening in 2019), there is something for every palette. All this is just the start. Later in 2019, you can take to the tracks at Andretti Indoor Karting and Games. Race high-speed go-karts, play more than 120 arcade games, and immerse yourself in a 7D experience at this entertainment destination. Catch the latest Hollywood blockbuster from the comfort of plush recliners at Galaxy Theatre. Complete the movie-going experience with food and drink from the in-house bar and restaurant. For all things outdoors, stop by the world’s largest all sport store, SCHEELS (opening in 2020). In addition to the 85 specialty shops that sell a wide range of athletic gear, the store will be home to entertainment for the whole family. Ride the 65-foot indoor Ferris wheel, view the 16,000-gallon aquarium, and play interactive games designed for kids of all ages. There’s a ton to see and do in Grandscape, so get here early to get the most out of your time here. Stepping into Nebraska Furniture Mart is like entering a different world. 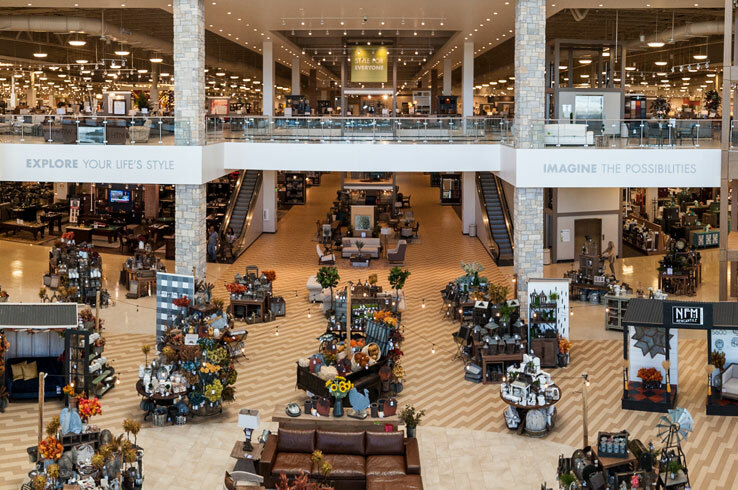 Spread across 560,000 square feet, America’s largest home furnishing store is a labyrinth of appliances, furniture, electronics, and flooring that has just about everything you can think of. Outdoor grills and patio sets, KitchenAid products, televisions, treadmills, and even Apple products are among things you can browse for here. Need a break? Stop by Scooter’s Coffee for a cup of joe, Subway for a quick bite, or indulge in some decadent chocolate at See’s Candies. Along with all the shopping, Nebraska Furniture Mart hosts must-see special events. Discover the latest tech showcased by big-name companies, participate in exclusive gaming opportunities, and connect with car enthusiast during monthly meetups. View a list of upcoming events on the Mart’s Facebook page. There’s a lot to see at Nebraska Furniture Mart, so make sure to bring your comfy shoes and set aside plenty of time to take it all in. Craft beer, delicious food, live music, and quality time with your puppy? This may sound too good to be true, but not so at The Shacks Dining & Dog Park. Take your pick from the long list of mouthwatering eats, including handmade street tacos, authentic Japanese ramen, and Texas-sized burgers. Then stop by Grrrowlers to sample one of the more than 25 craft beers on draft at the dog-friendly taproom. Enjoy your meal al fresco on the expansive patio overlooking the dog park. 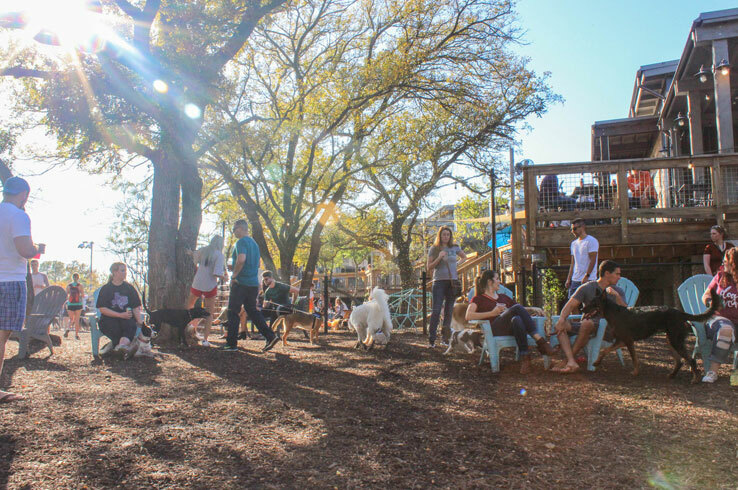 Speaking of which, the canine hangout is an off-leash park that features areas for dogs large and small to play and mingle with pups their own size. Although you can relax here throughout the year, you won’t want to miss The Shacks’ special events. Catch a performance from up and coming artists or shop local boutiques at the monthly pop-up market. For a list of the latest events coming to The Shacks at Austin Ranch, check out their Facebook Events Page. 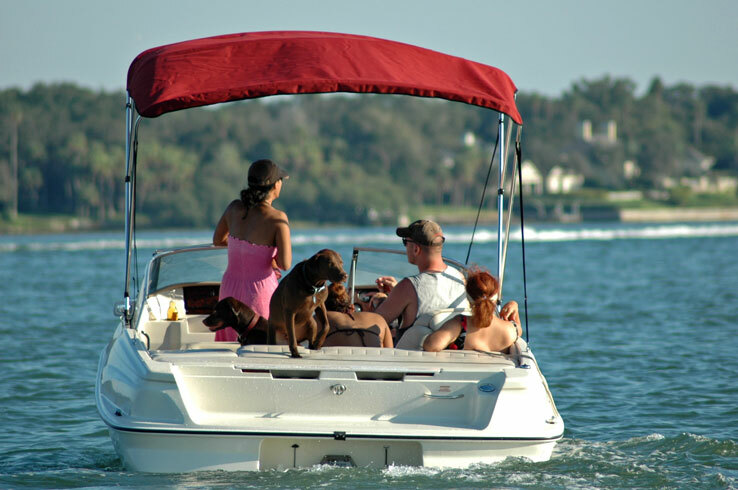 With its 23 miles of scenic shoreline, The Colony is a convenient starting point for some time out on the water. Whether you rent a jet ski or pontoon boat from the ship store or a stand-up paddleboard from DFW Surf, begin your adventure at Hidden Cove Park. Don’t miss out on the abundance of catfish, crappie, and bass swimming in Lewisville Lake. Bring your fishing rod (or check one out for free at The Colony Public Library) and cast a line from the new fishing pier at Stewart Creek Park. If you’re looking to simply soak up the sun, relax on sandy beaches at either lake park. Both feature boat ramps to launch your own watercraft, playgrounds for the kids, convenient shaded picnic areas, and other amenities to enjoy a full day at the lake. There’s a world of adventure to have on Lewisville Lake, and The Colony is a stellar launchpad to experiencing it all. Gently rolling fairways, lush greens, and a vast lake just beyond. You wouldn’t find this compelling combination at most golf courses, but in The Colony it’s standard. 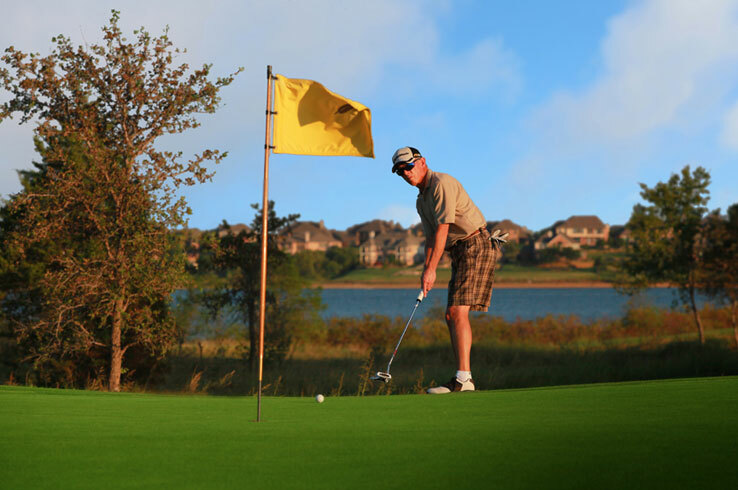 The town’s three golf courses offer breathtaking lake views and challenging play that’ll have you coming back for more. The picturesque Old American Golf Club is widely considered one of the best 18-hole golf courses in Texas, with its natural contours and homage to America’s Golden Age of Golf. The course is fit for experienced players, including the professionals during the Volunteers of America Classic – the only LPGA event in the state. If you have ever dreamt of playing at The British Open, take a swing at The Tribute Golf Links. The links-style course on the eastern shore of Lewisville Lake pays homage to the fabled courses of Scotland. The 18th hole is a treat all its own, as it’s a direct replica of the final hole at St. Andrews, right down to the Swilken Bridge. Finally, let the towering lighthouse at Stewart Peninsula Golf Course draw you to this part of Lewisville Lake’s shoreline. Set on a captivating peninsula, the course provides complex play that’s accessible to everyone thanks to the six tee boxes and double greens on each of the nine holes. Not only are all three courses well worth playing, they’re all open to the public. Visit each course’s website to book a tee time, then pack your golf clubs for a round you won’t soon forget. Stroll along the shoreline of Lewisville Lake and watch as birds and butterflies flit by. It’s easy to find inner peace away from the hustle and bustle of the big city on The Colony’s tranquil trails. 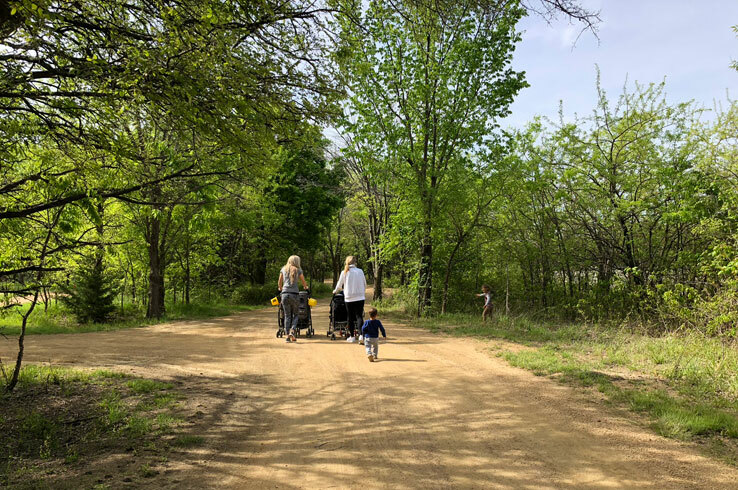 Both the Shoreline and Tribute Shoreline Trails provide over three miles of environmentally sensitive footing, perfect for casual hikes, bike rides, and jogs. When you wander through the dense woodlands and meadows, blooming wildflowers and a calm lake breeze will welcome you. Pause to learn more about native flora and fauna through educational signs dotting the trails. These are just two of The Colony’s trails waiting for you to explore. Find out more about the others here. Any season is a good time to visit The Colony, but there are a few one-of-a-kind events here you won’t want to miss. Swim with your puppy and participate in contests and games at the annual Bow-Wow Luau (Sept. 8), held at Hawaiian Falls Waterpark. Explore a trail haunted by ghouls and goblins during Family Fright Night (Oct. 19 – 20), a Halloween camping experience with hayrides, campfires, scary movies, and trick or treating. 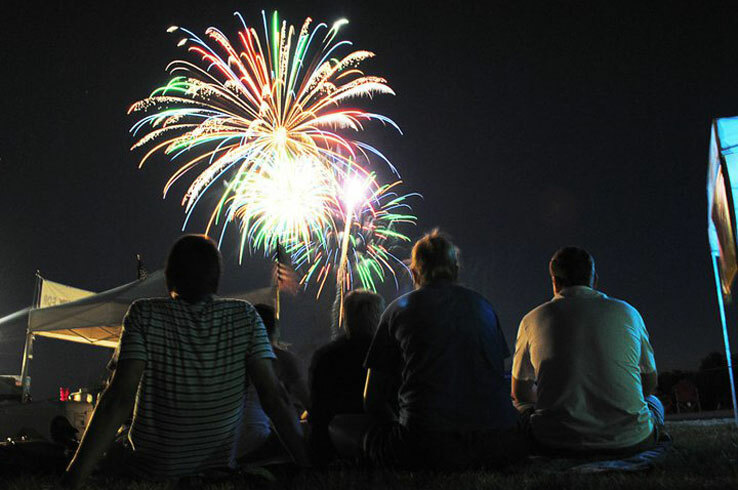 Finally, American Heroes: A Salute to Veterans (Nov. 9) celebrates those who have served our country with live music, great food, and an exuberant fireworks show. These are only a few of The Colony’s many great events. See a full list here. No matter what kind of adventure you’re looking for, you’ll find it in The Colony. Learn more about this Dallas-area destination and plan your trip here.